This is a premium class, unique machine for biscuit and cookie production. 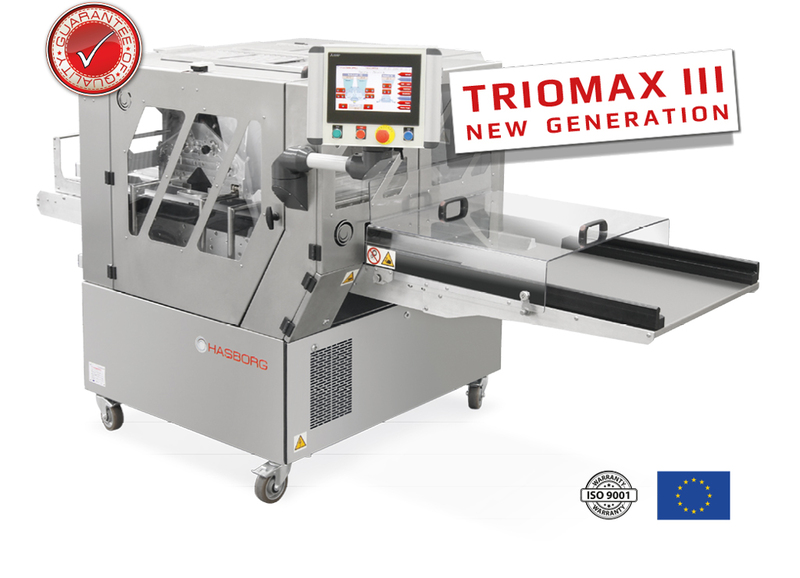 It is equipped with three TRIOMAX, hermetic heads and stainless steel rollers; it enables the production of wide range of biscuits and cookies with many shapes and lenghts, i.e: two colour filled cookies, two colour biscuits with top decoration, three colour biscuits, sponge tops, wire cut cookies, long biscuits cut by guillotine to the required length and cookies cut by shutter. As the only one in its class it has a diverse additional equipment thanks to which it is very universal and uncomparable to the other machines on the market. It can process various kinds of dough, e.g. : shortbread, steamed, gingerbread, sponge products, muffins, eclairs. Innovative hermetic heads: three (TRIOMAX), or two (DUOMAX). Automatic tray feeder with tray storage container. When the efficiency is high, it eliminates the necessity of having a second person‘s assistance to feed the trays. 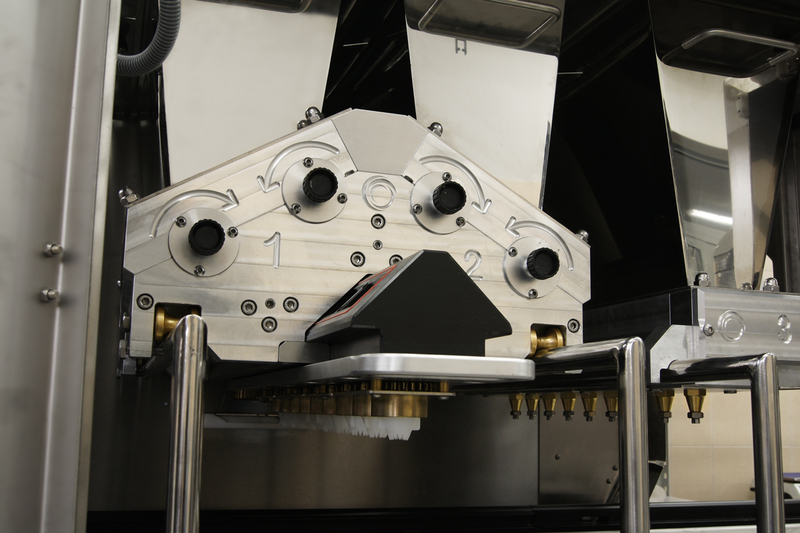 Double head is made of one single block of aluminium in order to increase working stiffness, unlike the other machines offered on the market. Each roll is equipped with bearings; this solution protects the dough from overheating during the process of dough distribution. The whole structure is made of stainless steel. Two column table lifting system – digital control to move the table up and down (for the production of cakes of different heights: 1-10 cm). Stainless steel rolls with spiral cuttings and rotation control. The increased diameter of rolls (ø115) and its smooth speed control prevent the dough from damaging and deformation during processing. IMU Unit – every machine can be connected to the Client‘s internet access point. Thanks to this, Hasborg service center can, if required, remotely connect to each machine for the service purposes, to upload software in case of new or upgraded program release, or to help with program set-up. Beared rolls – thanks to this solution the head does not generate excess heat, so the dough is protected from the high temperatures which destroy it. Dough distribution system module – system so far reserved and used for industrial units, now adopted to medium size machines. Dough leading slats and moulds with specially milled dough distribution channels reduce pressure in main head so the dough is passed more precisely to the forming nozzles. High efficiency. Servo drivers – high class and a proven solution that increases speed, service life and accuracy of components work. Powered by Mitsubishi Electric. Electronics and touch panel are simple and easy to use with multilingual menu. You can enter your own recipes and save them on the SD card. Automatic tray feeder with a cartridge. Automatic tray feeder with a cartridge. The trays are being transported using the chains, not the belts, as they tend to wear off more frequently. One should put 13 trays into the cartridge, and the machine will start using them automatically. produce the limitless number of shapes of your cookies. 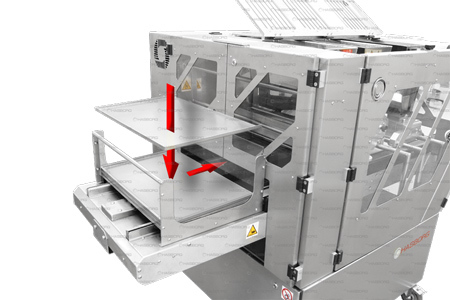 Shutter option is designed for shortbread and gingerbread biscuits production with filling. It is highly productive. It enables the production of biscuits and cookies cut by the guillotine knife to the required length with or without the filling. This optional equipment is provided with a special control system, which gives you the possibility to set up the production parameters precisely, and it is very efficient – up to 450 kg of final product per hour. The roller option allows to produce an extra shape of cookies cut by the guillotine. The roller is made of plastic, and it is driven by the guillotine table tape. 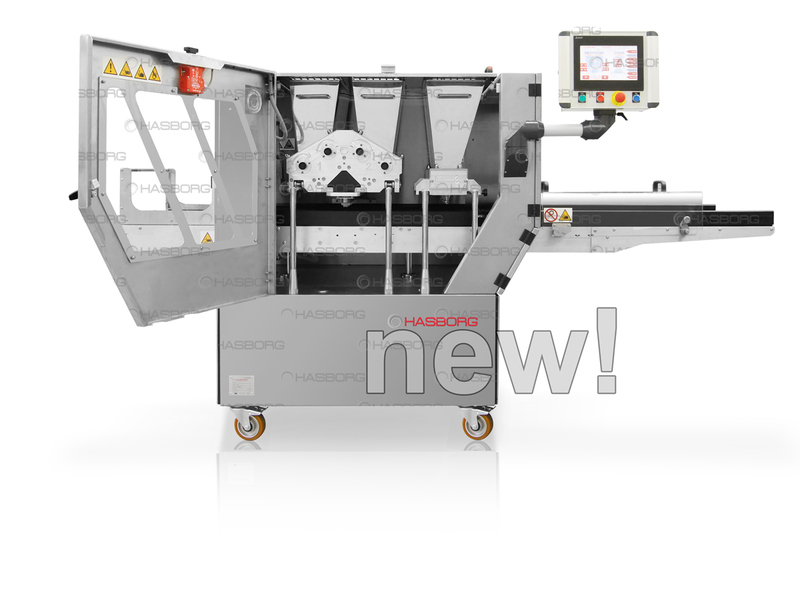 This option is dedicated to Hasborg machines such as Triomax or Duomax with the additional guillotine option. Table with tape and metal carriers.